Nicolas Diteriks has been composing the soundtrack for They Are Billions, an RTS game about humans surviving a zombie outbreak in a post-apocalyptic, steampunk world. 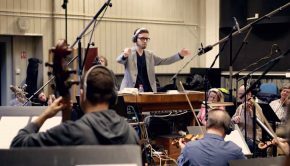 The soundtrack, a part of which can be heard in the trailer below, involved a scoring session with the Slovak National Symphony Orchestra, while the game itself is now available as a part of Steam’s Early Access program. Diteriks studied at the American School of Modern Music in Paris, France, and Berklee College of Music in Boston. He has since been involved as a sound editor in scores like Olivier Derriviere’s The Technomancer, and as a composer in Eminence: Xander’s Tales. Diteriks’ official website can be found here, while more information about They Are Billions can be found on their official Twitter. Posted on February 20, 2018 by Emily McMillan. Last modified on February 20, 2018.